Some of Humpty’s comrades rushed over and found him conscious and immediately moving around. “Dude! Are you okay?” shouted a comrade. Humpty said, “I’m fine. I’ve got strength like an ox.” Humpty and the crew returned to the task at hand, but Humpty was not at work Monday morning. This story of a fallen comrade might sound pretty familiar. Have you experienced a similar situation? Was Humpty properly looked after as a fallen comrade? The answer is – No. If a worker falls to a lower level or the ground, you want to make sure he or she is okay. 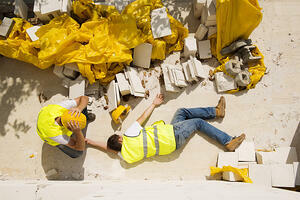 Keep in mind, make sure the scene is safe and do not put yourself in danger when assessing the fallen worker. Awake or asleep? Able to move? – If the worker is asleep or unable to move, call 9-1-1 (or your local emergency number). Injuries? – If you suspect head, neck, back or hip injury, call 9-1-1 (or your local emergency number). Minor injuries? – Apply first aid measures if you are trained to do so. What next? – If you did not need to call 9-1-1 and regardless if you rendered first aid for minor injuries, your next step is to transport the worker to your designated occupational medical clinic. This needs to happen quickly. The worker needs to be examined by a licensed medical care provider and receive a release to return to work. Your investigation should focus on the root cause(s) and not someone to blame. Preserve the Scene – It is best to document the scene with photographs or sketches no matter how serious the injuries. Secure the scene to prevent tampering of material evidence. File a Report – Document the worker(s) name, injury description, date and time of the incident, location and a detailed description of the incident. Conduct Interview(s) – Eye witnesses are key. Each eye witness should be interviewed as quickly as possible following the incident and remember to interview each separately. Ask open-ended questions such as, “What did you see, hear?” Avoid asking “yes” or “no” questions and never ask leading questions. Determine Root Cause(s) – There are several models to determine the root cause(s) (e.g. Five Whys). The primary goal of the Five Whys technique is to determine the root cause of the incident by repeating the question “Why?” Five iterations of “Why” is generally effective to reach your root cause. Execute Corrective Action(s) – Do not declare your investigation complete until preventative measures are in place to address the root cause(s). Do you need to retrain? Do you need to install better guards? Do you need to edit procedures? Avoid poor conclusions as they will ineffectively prevent a future occurrence and cause a decline in everyone’s self-esteem. Assessing the fallen worker and performing the incident investigation both have critical components and your team needs to be properly trained on all of them. If an incident occurs, you cannot survive if everyone around you has no clue what to do. Complete training for permanent (and temporary) workers. Leave no one out! Why did Humpty not return to work on Monday? If you recall, he said, “He was fine” the day he fell. The step of transporting him to the local occupational medical clinic, just as a precaution, was skipped. Humpty hit the ground harder than he anticipated and the internal bleeding was too much for the doctors to put Humpty back together. It’s simple – look after a fallen comrade. If you respond effectively to every fall incident, a tragic end may be averted and others like Humpty will live to work another day.